I grew up in a terraced house on the northside of Dublin. My dad was originally from Co. Clare and being outdoors was in his blood. So every chance he had, he packed my mother, my two brothers and me into his car and headed off fishing. While my brothers and my dad would fish late into the evening, I’d spend hours on the riverbank immersed in the comings and goings of all the wildlife that lived there. Tiny skater insects on top of the water, dragonflies in the air, birds in the hedges, and of course my favourite, the frogs. It was such a complex, interrelated place, yet it all worked simply and beautifully. I was mesmerized and would be enticed away only by the need for food. This is where my fascination and love affair with nature began. My fascination with nature never left me, however life took over; college, work, marriage and being a dad to two gorgeous girls. 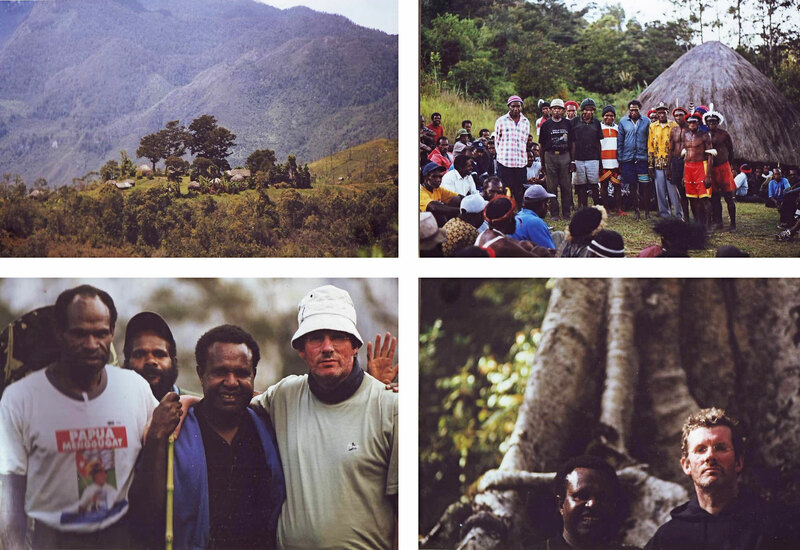 Then when I was forty I met an incredible man from the Winam Eragayam tribe in the highlands of West Papua. Our time together reignited all that boyhood love and passion that I had for nature and the environment. So much so that I accepted his invitation to travel to West Papua to spend time with his tribe learning about the rainforest and how his people lived not just in the forest but in deep relationship with it. One of things that blew my western mind was that the tribe do not speak of ‘nature’. They do not talk about nature as an external concept. Something you take a walk in, somewhere you do your meditation, somewhere that you enjoy. For the tribe there is no separation between them and ‘the nature’. They embody the feeling that they are fundamentally part of the essence of the rainforest and that the rainforest is fundamentally part of the essence of them. One cannot live without the other. My time is West Papua was profound. It also ignited a new desire in me to understand the interconnectedness of the world in which we live. Let’s take a journey together through interconnectedness. Native oak trees have evolved with the ecosystem over thousands and thousands of years. In the UK scientists studying the English Oak have discovered that one oak tree is home to at least 284 species of insects and 324 types of lichen. In autumn when acorns lose their cups, the oak tree provides nourishment for many wild creatures including jays, pigeons, pheasants, ducks, squirrels, mice, badgers, deer and depending on the woodland, pigs. Bats have been found roosting under the loose oak bark, who then feed on the rich supply of insects that live within the tree canopy. An oak is not merely an oak; it is a bustling ecosystem that supports over 600 species of life. This is why it is so important to plant native trees, because native flora and fauna have evolved with it, and have adapted to it and can make it their home. Quaking Aspen trees can be found in North America. They have a beautiful white bark and reproduce like a strawberry plant by sending out runners that sprout roots and grow leaves. In Utah, it was discovered that a forest populated by 47,000 Quaking Aspen trees, was in fact one tree that had reproduced vegetatively, 47,000 times! It covered an area of 106 acres (43 hectares). What is really amazing about the aspen is that some of the trees grew in moist soil and shared water with other trees that were in dryer but more mineral rich soil; a whole family of trees taking care of each other. Professor Suzanne Simard is a forest ecologist and one of a team of researchers that discovered that trees were connected to one another through an underground web of fungi , this network allows trees to communicate by transferring carbon, nutrients and water to one another. She also identified Mother Tree or Hub Trees. Mother trees are the largest trees in the forest and act as central hubs for vast below ground fungal networks. They support young trees or seedlings by infecting them with fungi and then ferrying them the nutrients they need to grow. Mycelia are threadlike extensions of fungi which live in the ground. Mycelia are present under the ground year round, and are only revealed by the occasional seasonal appearance of mushrooms. Mycelia cling to the roots of trees and form vast networks that look like underground spiders webs. As they are underground they do not have access to sunlight, but trees do. Through the process of photosynthesis trees get sugars, starches, vitamins and carbohydrates which they swap with mycelia for water and nutrients that are in the soil. Scientists in America discovered one fungi, one mycelia organism looking after an area of 1500 acres. The silver Y moth takes advantage of fast-moving airstreams hundreds of metres above the earth. Scientists at Rothamsted Research in the UK have found that migratory Silver Y Moths select the fastest and most favourable airstreams which allow them to migrate distances of up to 300km and 400km per night, flying at speeds of around 50km per hour. This allows them to move between their summer and winter breeding grounds. While flying through the air at heights of up to 1000ft they meet other travellers such as spiders and butterflies. Also to be found on these sky superhighways are bats that fly up over half a mile to feast on the migrating insects, it’s a buffet for bats! The Silver Y Moth is one part of an amazing ecosystem that hangs out in the earth’s atmosphere. The Bodélé Depression is a dry lake in the southern Sahara in Chad. Twice a year the dust from this dry lake is blown across the Atlantic Ocean to the Amazon rainforest. The ‘dust’ is made from fish bones and other organic matter that fell to the bottom of the lake thousands of years ago. It contains the perfect mix of nutrients needed by the Amazon rainforest because even though the Amazon is lush, it is nutrient poor due to the rainwater washing important nutrients out of the soil. For the dust to reach the Amazon wind is swept between mountains and then channeled across the depression. This lifts the dust into the airstream and carries it across the Atlantic Ocean where it is deposited via the rain to the Amazon where it is needed. This mind boggling inter-related process has developed over thousands of years. While meditating in my garden my attention was drawn to a bee landing on the flower on an old damson tree. For a moment I felt what it was like to be the bee. Over thousands of years the bee had evolved in relationship with the damson. The damson supplied the bee with pollen and the bee helped pollinate the tree. The bee was also swimming in a sea of oxygen. Oxygen and the bee had also evolved together. Oxygen was not always present in the earth’s atmosphere; initially there was only hydrogen and helium. And then I got it. The visceral realisation, that the bee, the damson, the oxygen, and me; we are all brothers and sisters and cousins because we have grown up together in this magnificent family of evolving inter-related life. In that moment I finally understood what my West Papuan friend had been trying to teach me all those years ago. You can’t have the fungi without the tree, and you can’t have the tree without the fungi. All are necessary pieces in the jigsaw of life. With the complex inter linkages that stretch over thousands of years and over continents it was impossible for me to consider that we are anything other, than One.